Join us in celebrating National Bioenergy Day! Organizations across the country are uniting to support bioenergy. On October 18, 2017, participating organizations will open their doors to their communities to demonstrate the many benefits that bioenergy provides on a local level. View full list of 2017 Bioenergy Day Participants here. The fifth annual Bioenergy Day is October 18, 2017. Check out the 2017 Bioenergy Day Video. More information on Bioenergy Day can be found here. Much attention has been focused in recent weeks on Farm Bill Energy Title programs – federal initiatives that offer farmers and rural businesses the opportunity to contribute to this nation’s energy strategy and add to their bottom line. Read the full story on the 25×25 blog here. BTEC announces the department of Natural Resources of Canada (CanmetENERGY) is now a full partner in BTEC’s efforts to develop a comprehensive and recognized efficiency standard for wood-fired boilers in North America. The draft standard is available on BTEC’s website, http://www.biomassthermal.org/. Like any combustable fuel, large-scale storage of wood pellets can be a dangerous proposition. Matters of dust, moisture, temperatures, deflagrations, density, structural integrity, location and public safety must all be thoroughly considered well before a single stake goes into the ground. The U.S. Energy Information Administration has released the September edition of its Short-Term Energy OUtlook, which includes updated forecasts for electricity production and generation capacity ofrom wood and waste biomass. The EIA currently predicts wood biomass will be used to generate 112,000 MWh per day of electricity this year, with that level to be maintained through 2018. Waste biomass is expected to generate 58,000 MWh per day this year, increasing to 59,000 MWh per day next year. The U.S. Energy Information Administration has released the September edition of its Monthly Densified Biomass Fuel Report, reporting that data gathered from respondents indicates they purchased a combined 1.06 million tons of feedstock in June, produced 570,000 tons of densified biomass fuel, and sold 430,000 tons of densified biomass fuel. 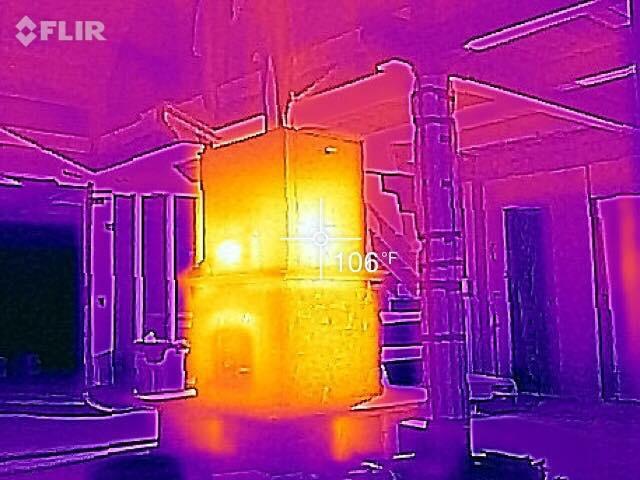 Below are thermal images provided by Eric Moshier of Solid Rock Masonry of two types of different masonry heaters. This thermal image is of a Tulikivi Soapstone Masonry Heater 24 hours after the fire was burned. 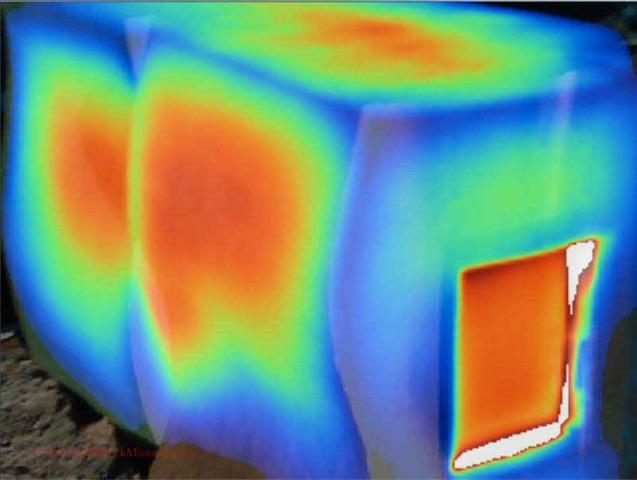 This thermal image is from a custom Austrian masonry heater. Both of these thermal images are taken of masonry heaters 24 hours after the fire was out showing the radiant heating capacity of a masonry heater. That is the beauty behind heating a home or business with a masonry mass stove. You load the firebox 2/3 full, which is the design load, burn the load hot and fast. The fire and hot gases go through a system of channels inside the masonry mass storing up to 85% of the energy in the wood to be released slowly over the next 24-36 hours. The fire is out after 2-3 hours and then you get radiant heating for the next day or more. Best of all is that masonry heaters burn incredibly clean with particulate matter (PM) emissions of 4gr/hr – .4 gr/hr on average depending on the firebox design used. With the right firebox, biochar is actually created which then turns the wood heating into the carbon neutral category. Coleraine – It seems like much of the world is plunging headlong toward renewable energy and away from fossil fuels and the carbon dioxide pollution they create. Fosnacht is leading the NRRI’s Renewable Energy Initiative team that’s developing a coal substitute made from roasted wood. The MN Clean Energy Job Board is a tool that job seekers can use to find jobs in the energy efficiency and renewable energy fields, and that employers can use to post their latest openings. All jobs are focused on the implementation of clean energy in Minnesota, and are not related to advocacy or policy. The Clean Energy Resource Teams (CERTs) has issued a request for proposals (RFP) for its 2018 round of seed grants. The Seed Grants are designed to provide limited financial assistance for community based energy efficiency and/or renewable energy projects in Minnesota. Project funding can support technical assistance services (i.e., labor costs only, such as for a consultant, design professional, installer, or student labor) for projects in all seven Minnesota CERTs regions: Central, Metro, Northeast, Northwest, Southeast, Southwest and West Central. Deadline for proposals- October 20th, 2017. USDA’s Rural Energy for America Program (REAP) grant can cover 25% of project costs and a project can begin after an application has been submitted. Applications are due October 31, 2017 for projects less than $80k and April 1, 2018 for projects of any size. REAP grants are competitive (1 in 4 applicants awarded). USDA’s Guaranteed Loan provides up to 75% of project costs and is not competitive. USDA Value Added Producer Grants (VAPG) Program helps agricultural producers enter into value-added activities related to the processing and/or marketing of new products.Applications due January 31, 2018. DOE: No-cost technical assistance. The DOE Office of Indian Energy provides federally recognized Indian tribes with technical assistance to advance tribal energy projects at no cost. St. Paul, MN – The Minnesota Department of Agriculture (MDA) anticipates awarding up to $1 million through the competitive Value Added Grant Program. Funding for the grants was established through the Agricultural Growth, Research and Innovation (AGRI) Program to advance Minnesota’s agricultural and renewable energy industries. The Value Added Grant program seeks to increase sales of Minnesota agricultural products by diversifying markets and increasing market access and food safety of value-added products. More information can be found here. MDA Biomass Thermal Energy Incentive Program. This is a production-based incentive and pays out based on heat generated by mostly Minnesota-sourced biomass. MDA’s Livestock Investment Grant covers 10% of a project’s eligible costs. The application period is September through December. MN CERTs 2018 Seed Grants are designed to provide limited financial assistance for community-based energy efficiency and/or renewable energy projects in Minnesota.Applications are due October 20, 2017. MN Department of Agriculture AGRI Sustainable Agricultural Demonstration Grant Program. Objectives of this grant are to expore profitability, energy efficiency and benefits of sustainable agriculture practices and systems from production through marketing. Applications are due December 13, 2017. National Forest Products Week is October 16-20, 2017. During National Forest Products Week, the value of America’s forests and the products they provide is celebrated, while also recommitting to sustainably managing the splendid natural resources to meet the Nation’s needs, both now and in the future. Expanding wood products markets reduces forest restoration costs and creates an alternative to burning or land filling the leftover woody material. A diversified wood products industry enhances resiliency of our ecosystems, sequesters carbon, and creates jobs in rural communities. Join us in celebrating National Forest Products Week! Heating the Midwest Incorporated has created a LinkedIn page and also a Facebook page. Follow the page to stay up to date with what we’re working on! Have a Biomass Project Idea for SWET? Heating the Midwest – Become an Action Team Volunteer! For more detailed information on the Biomass Combustion Technologies Action Team, please contact Andrew Murray ( andrew.treeguy@gmail.com); for the Biomass Policy & Benefits Action Team, please contact Gregg Mast ( Gregg_Mast@earthtechenergy.com); and for details pertaining to the Biomass Resources & Demographics Action Team, please contact Becky Philipp at bphilipp@auri.org or via phone at (218) 280-8575. As you’ve seen month after month; companies, governments, and communities around the Midwest are making progress on biomass heating and combined heat and power (CHP) programs and projects. If you have a story or event to contribute for next month, please submit by close of business the 3rd Wednesday of the month to kloeffler@heatingthemidwest.org. And, if you’d like to be on the list to receive upcoming newsletters, please contact Kelsey Loeffler at kloeffler@heatingthemidwest.org.